Posted April 2nd, 2014 by Simon & filed under casino. Playing poker to win involves careful betting strategy and knowing when to call a bluff, as well as knowing when to not. Learning how to spot a bluff from across the table will help you not only win, but advance to tougher games with higher stakes. Stress shows up differently for each individual, but it’s easy to spot to the observant player. Look for signs of physical stress in your opponent, like sweating, blushing, and jittery movements. Some people will bounce their leg or foot up and down as a way to release pent-up energy and anxiety. Sweat almost always comes in a stressful situation and is usually accompanied by flushed cheeks. Amateur poker players won’t be very good at controlling their outward appearance when it comes to high stakes. Body language is an expertly clever way to tell when someone is lying. All it takes is a few unconscious movements, and the bluffer’s façade will fade before your eyes. Watch for movements like a player wiping his hands on his pants; it probably means he is sweating and nervous. If another gambler covers his mouth with his hand, he is probably trying to hide a nervous tic. Refusing to make eye contact is a trick from the pros; if a player is unwilling to meet your eyes, it’s a safe bet he’s hiding something, like a weak hand. Professional poker players do their best to hide their faces by wearing hats and looking down to keep others from reading their expressions. Sometimes disappointment at a weak hand is impossible to disguise and will fleet across a player’s face in the seconds before resuming a neutral composure. Look for a raise in eyebrows, a twitch in the corner of a mouth, and a hard swallow. All of these fleeting facial expressions are dead giveaways for bluffing. While someone can have an unreadable poker face, listen to their voice. Take note of their natural octave before the hand starts. If during the game you can tell that their voice has gone higher or lower, they are nervous and stressed out. Correctly noticing this sign is usually hard to learn because you have to go off memory, but once you’ve mastered it, this trick is invaluable. You can tell a lot about a person by studying their betting patterns. If you notice a player folding frequently when asked to re-raise, he is a very careful better. Chances are in your favor for not calling his bluff, because he won’t risk a lot of money unless he has a strong hand. It’s just as important to recognize those who don’t bluff. Try a few of these tricks on your friends for practice before you play with the big sharks. Remember, the more experienced poker players are very skilled in hiding their telltale signs of bluffing. 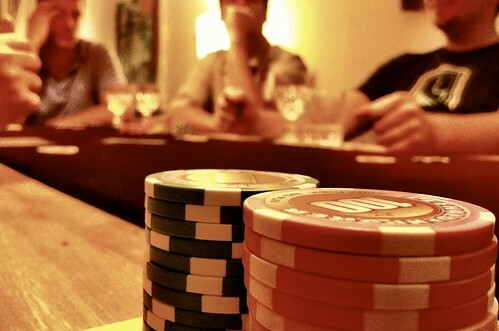 If you’re looking to make some quick cash with little effort, try playing at an amateur table.